(Newser) – The Senate won't be headed home at the end of July as originally scheduled. 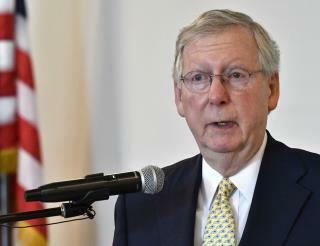 Majority Leader Mitch McConnell on Tuesday announced that the August recess would be shortened by two weeks and begin Aug. 14, giving senators an extra two weeks to get through high-priority agenda items like its ObamaCare replacement. The AP quotes McConnell as saying that once the Senate "completes its work on health care reform," it would move on to passing the annual defense policy bill and tackle "the backlog of critical nominations that have been mindlessly stalled by Democrats." Critical nominations or criminal nominations? Mitch! Hey good lookin', whatcha got cookin'? How's about cookin' up road kill to me?